In order for your website or app to produce a positive, memorable user experience, it is important to understand how the human mind works. 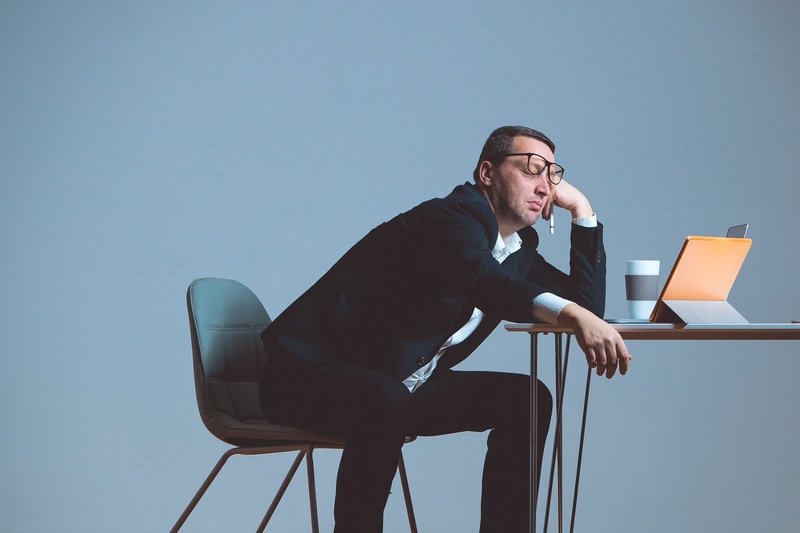 Without understanding how the mind perceives, processes and retains information, it is quite possible that an organization’s digital efforts will fall flat. Successful digital experiences not only generate increased engagement, but are also remembered by users afterwards. Knowing how to produce these types of experiences is key to achieving great user experience (UX). Here are some best practices for creating memorable digital user experiences. 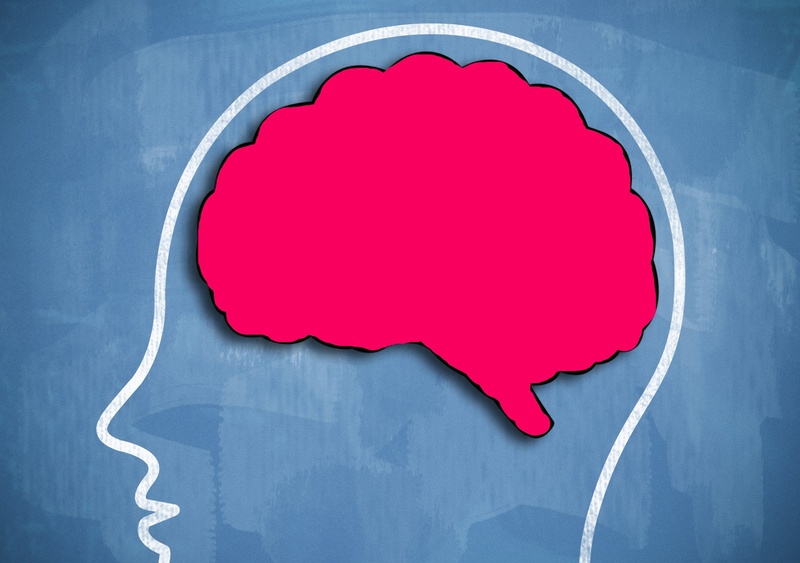 Short-term memory is just that – short term. Also known as working memory, this area only holds limited information before it is forgotten. Even when people focus on trying to remember something important in their working memory, a simple distraction can cause the information to be lost. 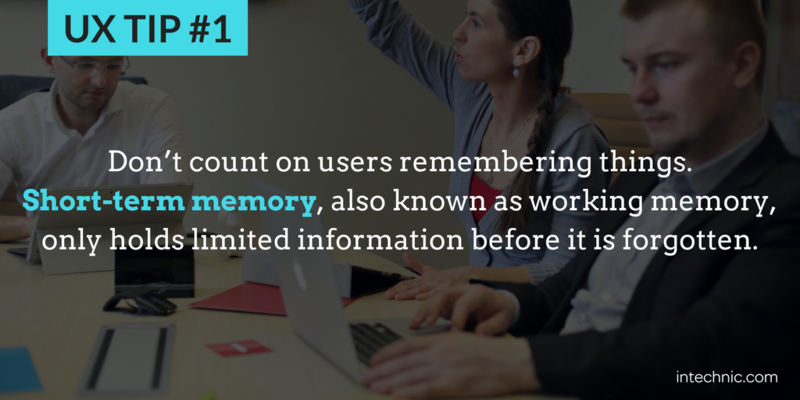 Don’t overwhelm your users’ working memory by making them remember things like promotion codes, member IDs, phone numbers, temporary passwords, etc. Instead limit how much users have to remember. For example, you could allow users to enter their email addresses to log in (instead of having to enter a member ID), or let shoppers apply a discount code directly to their shopping carts with one click (instead of having to remember it and enter it manually). To minimize the chances of information being lost, keep users focused on one task (or point) at a time. If there are too many distractions, such as new info being constantly introduced, the chances of a user forgetting the initial information increase. It is for this reason that carousel slides are ineffective; once a new slide has appeared it takes over their working memory causing the previous slide to be forgotten. Instead of a carousel, show visitors relevant messaging, such as content and offers directly tied to their needs, interests and previous behaviors. A different but related point is that information is most easily recollected from the beginning of a presentation (called the suffix effect) and from the end of a presentation (the recency effect). Middle information is most likely to be lost, so keep that in mind when writing content or creating any kind of a guided experience or presentation. This concept also holds true for online guided experiences (also know as “wizards”) that guide users through an experience. Both the beginning and end of the wizard are critical because this is what people will recall and act on. Make sure your experience has a strong beginning and ending that includes next steps or calls-to-action. While there are various theories about the “magic number” of items people can remember at a time, four seems to be one of the most promising. 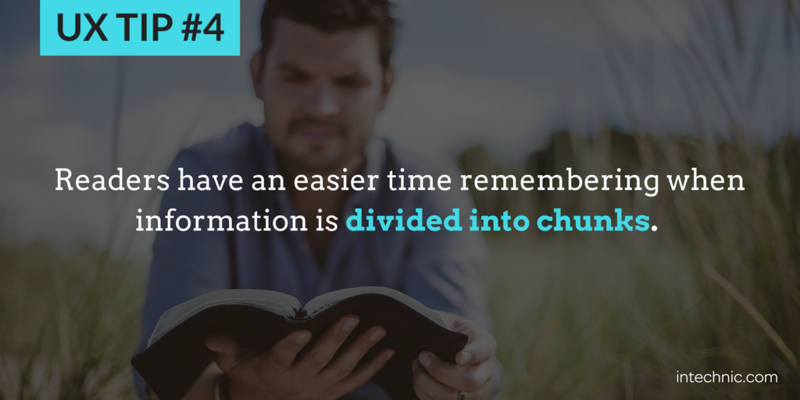 By dividing up information into separate chunks, each containing no more than four key points, readers will have an easier time remembering them. In a perfect world, we would limit all information to four key points, but this is not always possible. Chunking items together is another way of accomplishing a similar result. For instance, when a phone number is broken into chunks such as 615-123-4567 it’s far easier to remember than one continuous chunk such as 6151234567. Similarly, when you need to explain a complex process, break it into smaller parts, such as “Open an account in 3 steps.” This makes it easy for users to remember what to do. In order for memories to be transferred into long term memory instead of working memory, they must be either repeated or connected to prior knowledge. Every time a person repeats something, it sets off a series of physical electrical impulses in the neurons of the brain that help to strengthen memories and create a firing trace. This means that remembering the initial part of something triggers the rest of the trace, filling in the blanks. That’s why guided experiences where users can repeat steps after someone else are so effective.These are especially common in apps where first-time users are shown how and where to access particular features. This guided process allows users to learn features one-at-a-time in an engaging format. 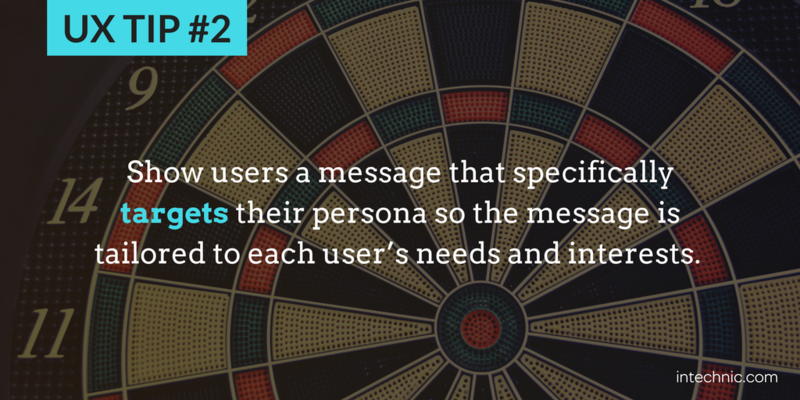 As users interact with the app, they remember how to use those functions. Creating schemata is another way people remember. This process involves taking individual pieces of information and labeling them appropriately associating with existing objects that people are familiar with. As an illustration, instead of having to remember a sofa, television, coffee table and lamp, people associate all of those items with one concept and simply call it a living room. By identifying digital features and concepts with real-life objects, you can make it easier for users to use and interact with them. For example, in a recent project, we introduced the concept of a “recipe box” and a “grocery list” where people can save lists of recipes and ingredients. We didn’t need to explain or remind users how these features work because they already understood the underlying concepts. The most widely used schemata online is the “shopping cart” – everyone knows how to use it. People have a higher memorization rate if they are given a recognition task rather than being asked to recall particular items. For example, it is easier for people to recognize a color or image associated with a webpage, than to recall a title or a location of a page on the site. 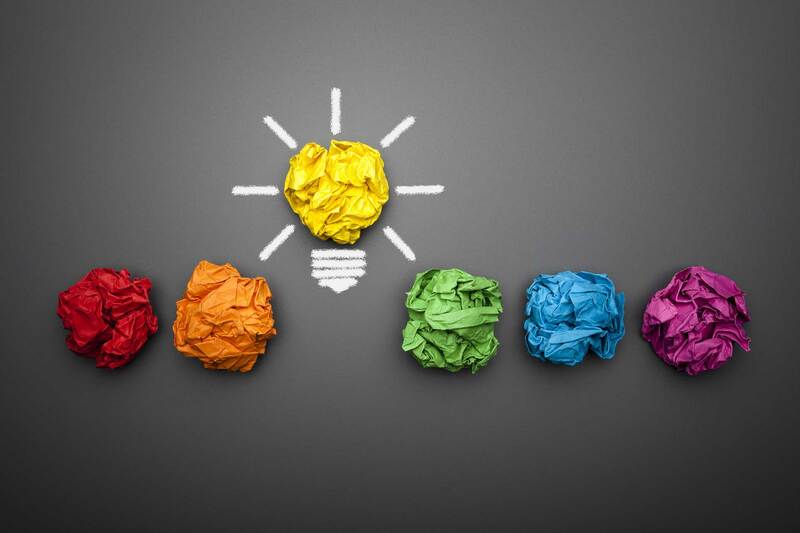 You can apply this knowledge by utilizing color coding and images to help readers recollect your content. You can also use colors, icons or images in toolbars and navigation. This way, users quickly start associating visuals with certain functions or sections. Don’t create more work than necessary for people’s brains. Research shows that people receive 40 billion sensory inputs per second. Of these, they are aware of 40. One of the best ways to avoid sensory overload is with progressive disclosure (commonly referred to as a “wizard.”). When interacting a wizard, users are shown only a few of the most important options available to them, and are shown additional choices only if they are applicable. This frees users from more complex features they do not need. One recent insurance website we worked on initially had over 200 forms for users to choose from on the website. We improved the website’s user experience by creating a wizard that asked very simple questions like, “Who are you?”, “What are you trying to do?” and “What changes are you trying to make to your policy?” to guide them to the right form. This strategy greatly reduced the amount of information bombarding visitors, making the experience more user-friendly. While many people think that memories are stored in the mind like home movies, they are actually reconstructed each time they are recalled. This means that memories can change over time, and be influenced by newer memories. Memories are also impacted by the language used in advance of recalling them, so using neutral terms that won’t sway memories may not offer the best results. Instead, create emotional moments with videos, which especially effective. All aspects of the video, from the images to the music to the narrative allow us to connect with users through multiple senses. 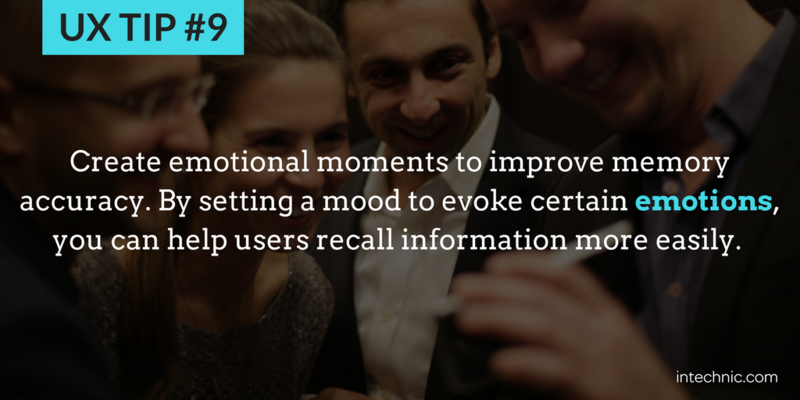 By “setting a mood” to evoke certain emotions, you can help users recall information. Lastly, bear in mind that forgetting is a necessary part of life, and is required in order to function properly. With so many sensory inputs every day, remembering them all would overload the mind. The brain takes care of this problem by eliminating what it perceives to be unnecessary. This process is unconscious, and people can’t influence what the brain chooses to forget. 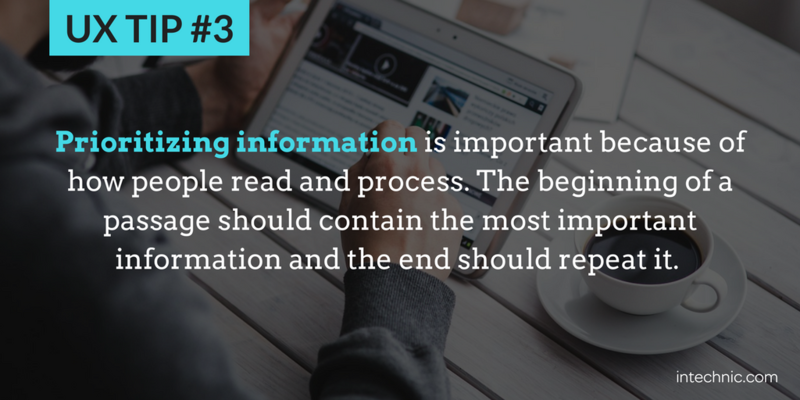 With this in mind, avoid excess information because the more info there is, the more things people have to forget. 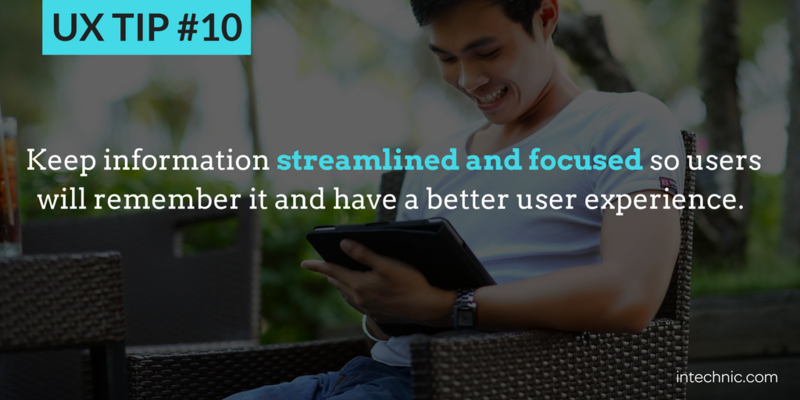 Keep information streamlined and focused, so users have the best chance of remembering it and enjoying a better user experience. If in spite of your best efforts, people forget, it is no reason to despair. 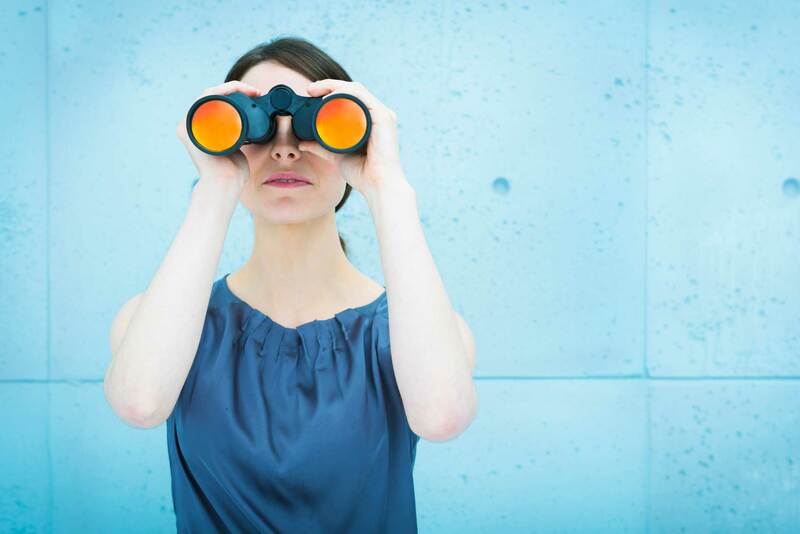 Give users an easy way to locate and retrieve relevant information that they may have forgotten. And forgetting isn’t all bad; people forget information they deem unnecessary so to remember the most relevant information. 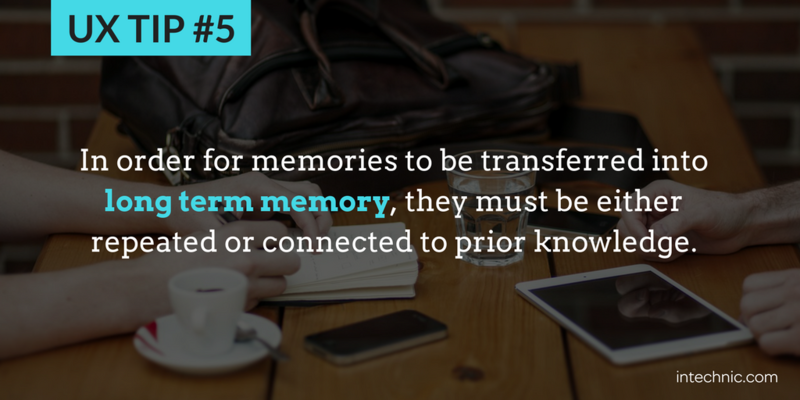 You can help them remember the most important information you want to convey by applying these memory tips. And in the process, you will create a memorable user experience.